With Washington DC, Philadelphia, and the city of Baltimore all nearby, it’s easy to see why the cruise lines enjoy having ships sail from the Port of Baltimore. Indeed, the port is now a major hub on the East Coast, the perfect midpoint between the busy ports of Florida and the New England ports of New York and Boston. Today, you can sail year-round to points in the Caribbean, the Bahamas, Bermuda, and New England. You also have your choice of two cruise lines — Carnival and Royal Caribbean. If it’s your first time sailing from Baltimore, you likely have a few questions about your cruise… how to get there, where to park, where to stay, and even more. So to help you get started, we’ve covered the basics of the port to give you a better idea of its location and layout. The links below should also help you answer some of the common questions about sailing from the port. The cruise terminal is located south of Baltimore’s historic downtown on a spit of land called Locust Point, just off of Interstate 95. The port is about three miles (10 minutes) from downtown and 11 miles from Baltimore-Washington International Airport (BWI). If you are in the Washington, DC area, then it’s about a 40 miles trip to Baltimore. There is only one terminal at the port, which helps to keep things more sane on cruise day compared to busier ports like New York or Miami. For convenience, parking is on site, just steps away from the ship. Getting to the Port of Baltimore — Transportation options from airports and the Baltimore area to the cruise port. Everything you need to know to get to the port and start your vacation. Baltimore Cruise Parking — Parking at the port? We’ve got you covered with all your parking options, including costs and discounts. 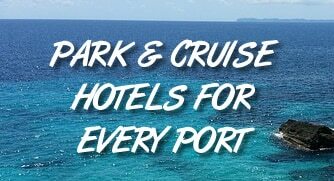 Baltimore Park and Cruise Hotels — If you plan to stay in Baltimore the night before your cruise, look at this list of hotels that offer cruise parking with a one-night stay. Baltimore Cruise Hotels — Getting in late? Leaving early? Simply need a place to rest your head? We’ve rounded up the options for places to stay near the port.